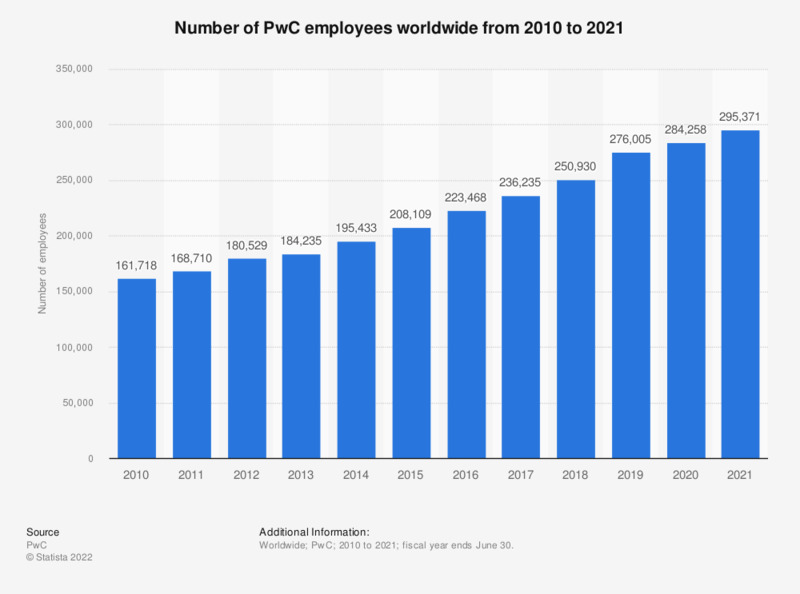 This statistic illustrates the number of PricewaterhouseCoopers employees worldwide from 2010 to 2018. In the fiscal year of 2018, the company employed 250,930 people worldwide. The terms PricewaterhouseCoopers and PwC are used to refer to the network of member firms of PricewaterhouseCoopers International Limited (PwCIL). Each member firm is a separate legal entity and does not act as an agent of PwCIL or any other member firm. PwCIL does not provide any services to clients. Values up to 2016 were taken from previous annual reports. Everything On "PwC (PricewaterhouseCoopers)" in One Document: Edited and Divided into Handy Chapters. Including Detailed References.